Tim Truman is a Supervisory Public Affairs Specialist currently covering the APEC Senior Officials Meetings and other events in Big Sky, Montana. This week we’ve been talking a lot about small business, competitiveness, supply chain issues, and growing a green business here in Big Sky, Montana with the 21 economies of the Asia Pacific Economic Cooperation, or APEC. One business here in Bozeman stands out above the others. 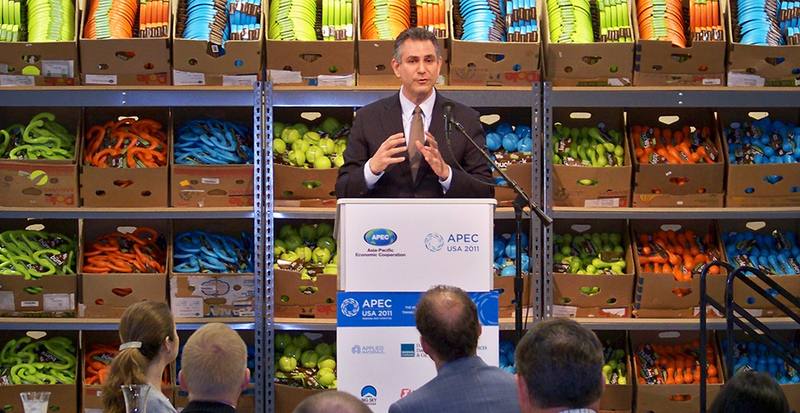 Under Secretary of Commerce for International Trade Francisco J. Sanchez speaks at the West Paw Design event. West Paw Design is a Bozeman, Montana-based manufacturer of high-quality beds, toys and apparel for dogs and cats. The people behind the company are proud to offer eco-friendly pet products that are made in the USA. Beginning with certified organic cat nip in 1996, West Paw Design has continually added healthy, safe and eco-friendly materials to its growing mix of pet products. By using fill made from reclaimed plastic bottles for its stuffed beds and toys, the company has diverted more than 5 million plastic bottles from landfills to date. In addition to the recycled, recyclable and organic materials that go into many products, West Paw Design is driven by a responsibility to make environmentally sound choices when it comes to its manufacturing facility and processes used each day. Today Commerce Secretary Gary Locke visited West Paw Design along with many representatives from the APEC Small and Medium Enterprise Working Group to see how West Paw Design has made use of many government and local resources to achieve the success in becoming a regional leader in the field of sustainable manufacturing. West Paw Design is a prime example of how small manufacturing companies can take advantage of local, state and federal resources offered at minimal cost to help them become sustainable, competitive and profitable. They currently employ 41 people and profits have grown more than 10 percent in the past year while employment grew 17 percent. Just a few of the resources that West Paw Design has used include an SBA 504 loan to expand its building. The expansion project supported 29 local jobs and generated over $2.5 million in total economic benefit to the community. Additionally, when looking to expand into new export markets, West Paw Design made use of the U.S. Commercial Service’s network of products and experts to learn about managing risk, foreign duty rates and VAT charges. This event is an opportunity for participating companies and policy makers to learn about the types of resources APEC economies have developed to help small and medium enterprises implement sustainable business practices.